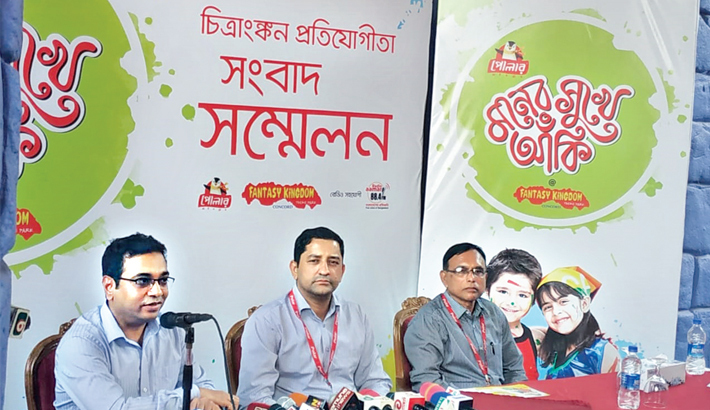 Concord Entertainment Ltd, the largest amusement and entertainment company of the country and Dhaka ice cream Industries Ltd is going to organise a biggest painting competition for the children this year. The event “Polar ice Cream Moner sukhe Aki” will be held at Fantasy Kingdom Complex in Ashulia on March 26. This was disclosed at a press conference held at the Fantasy Kingdom on Friday. General Manager of Fantasy Kingdom Complex Major Manzoor Ahmed (Retd. ), Head of HR& Administration of Dhaka Ice Cream Industries Ltd Mehraj Hamid, Regional Sales Manager of Dhaka Ice Cream Industries Ltd Suranjan Kumar Saha were present at the press conference among others. Online registration is compulsory for participate this competition. The registration already has started from 16th March. The last date of registration is 23rd March. Children are allowed to paint on any subject, in any medium. You will have to follow the Facebook page of Polar ice cream or Fantasy Kingdom Complex to get the update of the competition, participate in the event and all kinds of information. For registration, visit—bit.ly/monershukheaki.